The Vancouver Fraser Port Authority is aware that a public rally has been organized for this weekend by MP Jenny Kwan and community members in opposition to the proposed Centerm Expansion Project. The port authority respects the right of any group to voice concerns and opinions in a public way. A permit application for the project has not yet been submitted to the port authority. A round of public pre-consultation, intended to get early community input to the project design and conducted by an independent consultant, concluded on February 12, 2016, and a summary report has been posted to the project website. If a permit application is submitted for this project, the port authority will conduct a rigorous project and environmental review of technical studies that assess such things as noise, view impacts, air quality and other impacts of the proposed project, including effects on water circulation near CRAB Park at Portside in response to concerns raised by community members. The project as proposed does not physically touch CRAB Park. The proposed Centerm Expansion Project is part of the port authority’s long-term strategy to ensure the port is ready to handle Canada’s growing trade of goods in containers. Centerm is an existing container terminal operated by DP World, a global marine terminal and supply chain company. 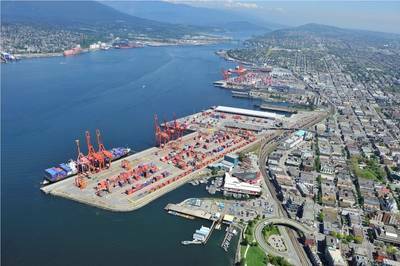 Under the Canada Marine Act, Canada Port Authorities have been responsible for the administration, management and control of federal port lands and waters, including conducting environmental reviews for all projects and works, since 1998. Environmental reviews by federal authorities are completed as per the Canadian Environmental Assessment Act. Information about the port authority’s review process, timelines and guidelines for consultation are available on the port authority’s website. Members of the public are encouraged to sign up to receive notices of all activities and new information on the Centerm project, and any other project of interest, through the port authority’s website.